TV presenter Ant McPartlin has pleaded guilty at Wimbledon Magistrates' Court to drink-driving. The 42-year-old was charged by postal requisition on March 21 after allegedly being involved in a collision with two other cars while he was driving his Mini in Richmond, west London, on March 18. McPartlin appeared alongside Donnelly on TV screens over the weekend as Britain's Got Talent aired i ts pre-recorded audition shows. The prosecution says that McPartlin has apologised to police for what he has done, and admitted that he has a problem with alcohol and âemotional issuesâ. The star blew a breathalyser reading of 75mcg of alcohol per 100ml of breath â" the legal limit is 35 mcg. What could Ant's sentence be? It is likely that sentence will be passed on the same day - as happened with Wayne Rooney last September. If this happens, the punishment could be to impose a driving ban, slap Ant with an unlimited fine and even impose a jail sentence (although this rarely happens). 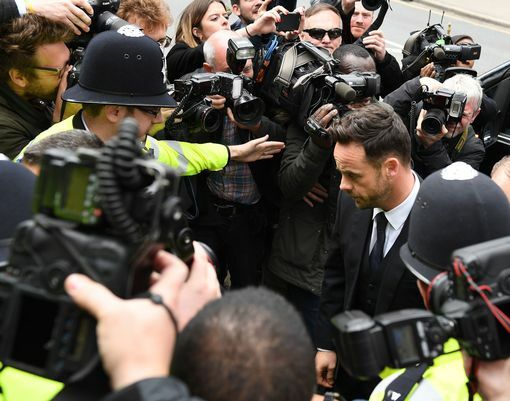 Ant McPartlin has pleaded guilty to drink-driving. The court hears McPartlin lost control of his Mini car and then failed a roadside breath test. The hearing is listed for 2pm - Ant McPartlin has now entered court seven at Wimbledon Magistratesâ Court. He is reportedly in the dock and staring straight ahead. This is the moment Ant arrived outside the court and made his way past the press. He is due to appear before magistrates shortly. The 42-year-old, wearing a black suit and white shirt, faced a scrum of photographers and reporters as he walked up the steps at the main entrance to the court building in south-west London, which was guarded by seven police officers. He hasnât been out in public for nearly four weeks, and itâs not thought his telly partner Declan Donnelly or his estranged wife Lisa Armstrong have been to visit hi m at the clinic. The 42-year-old Iâm A Celebrity host looked sombre as he walked into the building flanked by his legal team. He will be asked to confirm his name and address by the court clerk, who will also read out the charge. Ant will then be asked whether he pleads guilty or not guilty to the offence of drink-driving. 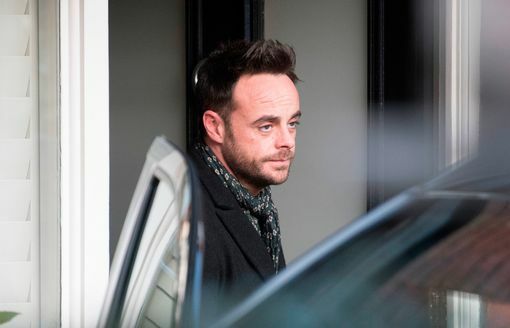 Ant McPartlin has arrived at Wimbledon Magistratesâ Court ahead of his hearing for one charge of drink-driving. The Saturday Night Takeaway presenter was seen striding into the building before proceedings start at 2pm. Itâs the first time heâs been seen in public since voluntarily checking himself into rehab to tackle his problem with alcohol on March 21 - three days after he allegedly crashed his car into two other vehicles in south west London. Ant was arrested after being involved in a collision with two other cars while driving his Mini in Richmond, south west London, on March 18, one of which was carrying a four-year-old girl. It is alleged that the star âdrove a motor vehicle, namely a Black Miniâ¦ after consuming so much alcohol that the proportion of it in your breath, namely 75 microgrammes of alcohol in 100 millilitres of breath, exceeded the prescribed limitâ. A huge security presence is now outside Wimbledon Magistratesâ Court where McPartlin is due to attend. At least seven police officers wearing hi-vis and helmets waited outside the entrance. And a host of photographers and reporters are gathered on the pavement outside the court for their first glimpse of the TV star. 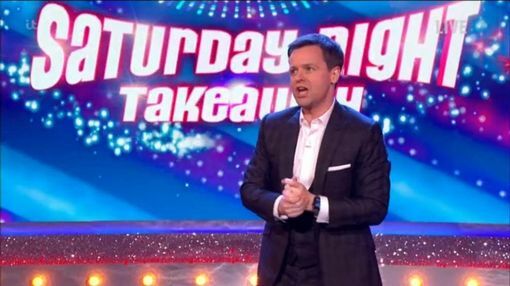 Dec went solo for the penultimate show and finale of Saturday Night Takeaway in Orlando, Florida. His first solo stint was a hit, drawing in an average of 7.7 million viewers - a 39% a udience share - peaking at 8.6 million. Suzuki has axed its advertising deal with Ant McPartlin and Declan Donnelly, two days after McPartlin was charged with drink-driving. A statement from the car company said: âSuzuki are withdrawing their advertising campaign with Ant & Dec. No further material featuring the duo will be aired and Suzukiâs endorsement deal with the pair has come to an end. ITV bosses have confirmed that Dec will host the Britainâs Got Talent live shows on his own. Following his arrest, McPartlin announced that he was stepping down from his TV commitments for the âforeseeable futureâ and would be going back to rehab. Ant McPartlin had an emotional return to Saturday night television this weekend. Declan Donnellyâs co-host was brought to tears as he returned to TV screens, pressing the golden buzzer for a Britainâs Got Talent act. Magician Marc Spelmann, from north London, wowed Ant and Dec with his emotional trick, which also featured a Rubikâs cube, crayons, and his wifeâs favourite book. In a touching moment, Spelmann said the real magic was the birth of his daughter, who was born through IVF, as he shocked the audience with the elaborate trick which involved a video of the youngster matching choices the judges had made. 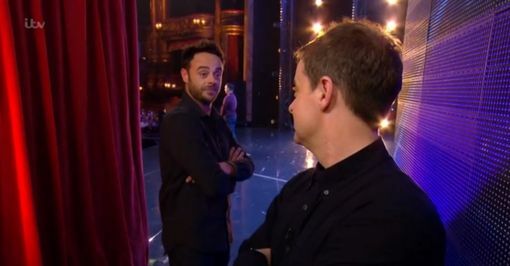 In pre-recorded scenes filmed in January, Ant and Dec ran out from the side of the stage to press the golden buzzer, sending Spelmann straight through to the live semi-finals. 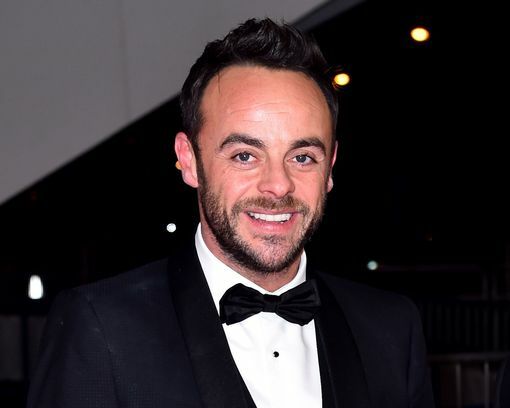 The pair were united on screen for the first time since Ant was charged with drink-driving in March and took time off from his TV commitments to check into rehab. TV presenter Ant McPartlin is due to appear in court today. The 42-year-old had been scheduled to appear at Wimbledon Magistratesâ Court on April 4, but the hearing was adjourned. The case is due to get under way at 2pm.